Spread Offense Playbook - Download Now! Stopping The Spread Offense - Download Now! One of the best quotes I ever heard and still truly believe is: 'Leaders are Readers' or in the modern era 'Leaders are Readers and watch Video'. I can't stress how important it is to use recording technology to your advantage if you want to learn and study something, especially the sport of football. The ability to tape games via a DVR machine (usually available through a cable company, satellite provider, or telephone TV service like Verizon FIOS) or a standard video recorder right from the comfort of your home is very valuable free resource. If you're a coach that is passionate about running the spread offense or a coach passionate about stopping the spread offense, I would have to ask if you've taped most or all of the 2008-2009 college bowl games with teams that run the spread offense or some hybrid of it. That's A LOT of spread offense to evaluate and learn from. It may not be too late if you missed a lot of these because ESPNU and ESPN Classic do a good job of replying these games for a few weeks after the bowl season. These games are so valuable for learning and seeing what some of the best spread offensive minds are thinking and more importantly what some of the best defensive coaches are doing to stop it (or at least trying to do too stop it). If you ever read 'The Art of War' by Sun Tzu, he mentions a very important point: "keep your friends close, but your enemies closer". If you want to be a great offensive spread coach, you need to know what the defensive coaches are thinking and planning to stop you (and vice versa). The ability to breakdown film as a coach is a critical skill, not just your teams or your opponents, but what I call 'third party' film. Imagine in your head what you might call that 'third party' play based on your terminology and formations. When I coached, I had a lot of 'specialty' plays that I stole from the likes of the Ol Ball Coach (Spurrier) and Bobby Bowden, plays like the Gator Counter and the Seminole Toss Pass. I still have boxes of old VHS taped from the early 90's thru the early 00's that I just can't part from (my wife thinks I'm nuts) with game upon game that I recorded. 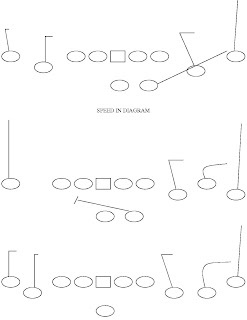 Get detailed on paper with notes if you see something you really like, what are the lineman's splits?, are there any influence blocks (or joker type techniques on the O-Line) taking place?, is the slot receiver acting out the bubble screen?, what's the play tempo like?, what's the down and distance?, where on the field is the ball?, what are the backfield splits?, etc. Try not only praising the video, but be critical of plays when you evaluate 'third party' film. Is the quarterback carrying out his option fakes or carrying out the zone read bootleg fake on the hand-off? Is the tailback carrying out his fakes if he doesn't get the ball on the zone read? Are the X and Y receivers blocking aggressive enough on the bubble screen? Coach the other teams on the video as you would coach your team. Besides video resources, another free option is to simply call a college or high school in your area that runs the spread offense and ask the coaches if they would clinic with you and your staff. Most staff's are very open to this, especially if you have some solid recruits that may be of interest to them in the future. Even if you don't and you're say a Pop Warner coach, most coaches will be glad to assist. There are many good resources that you can pay for, many of these I have personally used and others I am going off references from other coaches. I personally prefer video over books when it comes to coaching instructional stuff. The ability to rewind, slow mo, pause, and taking notes while watching is very valuable as opposed to reading it. What I do enjoy reading is more motivational type stuff, life balance, or organizational books to help build teamwork, character, discipline, work ethic, and courage (the 'intangibles' of football). Before I get into my favorite spread offense instructional videos, let me share some of my favorite motivational, positive attitude, life balance, organizational, and leadership books. I have attached below an Amazon.com online search box for your convenience to order these books. Just so you know this is a mix of books that I feel will make you a well rounded leader and person, both on the football field as a coach and in life. To me, balance is the key to be a great leader, motivator, and teacher. I have produced hyperlinks above so simply click on the titles to view these fine videos and clinics. If you're interested in purchasing them, follow the directions once the page launches. One area I'm not going to elaborate on but is critical for a successful spread offense is your off-season strength and conditioning program. This not only builds strong, fast, athletic athletes, it also goes a long way in building teamwork, togetherness, and comradery amongst your players and staff. "The key is not the will to win . . . everybody has that. It is the will to prepare to win that is important.” - Bobby Knight. Best wishes in your off-season preparation, and keep spreading them! One of the big advantages of the spread offense is to use the quick passing game (i.e., slants, stops, speed ins, sticks) as well as other routes and combinations to exploit the defense. At the most basic level, the quick passing game works well because it is high percentage passing, beats blitzes, minimizes an aggressive pass rush, and allows your best athletes – usually your slot receivers - to make moves on linebackers in space.